As a manager, one is always obsessed with expansions, diversifications, setting up new projects, and the like. In other words, boosting the organization’s top line. However, another important aspect of a manager’s role is to ensure that business units showing signs of sickness do not bog the company down and erode its market goodwill. How does one do it smartly? Out of several companies I worked for in my career of 35 years, I had the unique experience of closing down business units in four. The reasons for closure were as diverse as the culture and the size of the company I was associated with then – an over-estimation of the marketing prospects of a product or service, a shrinking marketing space owing to changes in market characteristics, high overheads leading to sustained financial losses, abysmally low levels of productivity, IR issues, supply chain bottlenecks, financial mismanagement and the like. In one particular case, a peculiar combination of these factors had led to negative financial contributions – the more the unit produced, the higher were the losses incurred! All the closures I had been involved with were manufacturing set-ups. All the organizations were configured differently – if one was a large company with a bureaucratic set-up, another was a fleet-footed medium-sized company; yet another was a small-scale unit where entrepreneurial zeal had misfired. Culture-wise also, the companies were poles apart. From an open manner of decentralized working to a secretive style of centralized decision making, one had a closure challenge which had to be met in tandem with the way the organization was configured. The task was surely unpleasant, but the learning was invariably rich. Whatever the reason, the size or the culture of the organization, there was not much difference in the basic steps to achieve the goal. The difference came about only in the detailed approach to each step. The larger the size, the better the refinement in the approach towards handling an aspect of the challenge. In all cases, conceptualizing a closure was a much simpler affair than executing it. Breaking Up The Task: When it comes to dissolution, fixed assets like land and building need a different approach. The skills required to handle requisite government permissions are surely not the same as those required for liquidation of inventories. Admittedly, the biggest challenge is to hold the hands of customers and of the people getting impacted by the decision. Making Smaller Teams: The probability of meaningful decisions getting made and executed at the operational level is inversely proportional to the number of members in a team. It also helps to have a dissenter in each team – someone who will stand up for his/her convictions. The senior guy in each group plays the role of an arbitrator, if and when necessary. Planning Well: A typical closure may take anywhere from 9 to 24 months to plan and execute. At the planning stage, tasks may be identified and allocated to various teams. The most important priority is to ensure minimal disruption in fulfilling the order book commitments. No less critical are good relations with suppliers and service providers who can add value by remaining committed to the organization till the end of the road. Timely payments come in handy in this area. Using Grapevines: Informal networks and cliques are surely of immense value when rolling out a closure plan. To keep undue demands under check and to ensure a fair deal to all stakeholders, grapevines can be used very effectively. Listening to Legal Eagles: Before freezing a Closure Plan, allow your Legal Eagles to put it under a microscope and chew it over. Down the road, there would be lesser surprises for the teams which are tasked with executing a closure. Flaunting Your Assets: Alternate utilization of land and buildings needs immaculate planning upfront, as does the shifting/disposal of plant and machinery. Way back in 1924, the Dallas assembly plant of Ford was redeveloped as loft apartments. In mid-1980s, DCM, a textiles conglomerate in India, closed down its Bara Hindu Rao factory in Delhi and contemplated a real estate project at the site. In 2005, Alfa Romeo managed to convert its Milan factory into a museum dedicated to the automobile industry in Italy. In 2008, Chrysler estate at Delaware was shut down in USA. It was bought over and converted into a science and technology campus of the University of Delaware. Closure of several textile mills and movie theatres in India in the recent past has resulted into swank new malls and residential apartments coming up. Preparing for Role Reversals: The Marketing team pores over the details of minimizing the damage to company’s image, whereas the Sales team starts working with your distributors and franchisees to fine tune the details of stock liquidation. Just as your Purchase team dons the Marketing hat and starts liquidating unwanted stocks, the Production and Maintenance guys roll up their sleeves and start worrying about getting the conveyors and machinery prepared for packing and disposal. The Finance team starts reviewing the organization’s obligations to financial institutions, and HR honchos start finding jobs for employees about to face an onslaught of the dreaded pink slips. Communicating Proactively: If there is something worth communicating, it is worth over-communicating! All stakeholders, including the community near the plant, need to get convinced that the closure is a ‘no option’ decision of the management. Communication needs to be designed to ensure that the management is perceived to be fair, transparent and caring. Handling People: There is a limit to which the issue can be kept under wraps. People are much smarter than we give them credit for. It helps to have a time-bound plan for necessary information to flow to different levels of the organization. Sure enough, this works best on a need-to-know basis. The CEO, the Plant Head or the HR head can play the role of a PR guy very effectively, though there could be other managers who have good people skills and can address concerns more effectively. The latter option provides better elbow room to the CEO/Plant Head in adopting a flexible approach. Other than a severance package, an enlightened management would offer out-placement services and hold the hands of those who have undue anxiety. When BP shut down its solar panel facility at Frederick, so as to shift manufacturing from UK to lower wage options in China, India and elsewhere, besides three months’ full pay and benefits,it offered a severance package and placement assistance to the affected employees. Good employers would travel the ‘extra mile’ to ensure that spouses, kids and parents of those affected would get taken care of as well. Expecting the Unexpected: If either the reason for closure or the severance package is perceived to be grossly unfair, we could be inviting unsolicited interference from unexpected quarters. These could be government agencies, politicians or some disgruntled elements well-disguised as self-proclaimed well-wishers of the workmen. This needs deft handling, backed by tact and resource. The detailed strategy, planning and execution would obviously vary depending upon whether the whole company is being shut down, or only the manufacturing units are getting closed, or only a single plant is facing a ramping down situation. With manufacturing getting increasingly shifted from the developed part of the world to the developing part, more and more organizations are faced with a closure scenario. Call it by any name – restructuring, redesigning, re-engineering, ramping down or down-sizing, the key elements to be handled in a closure are Customer Relations and Human Resources. A couple of years down the road, would a majority of those affected by a closure be still speaking well of the organization? Would your customers be missing your product or services? As long as these criteria are met, the management would have done a smart job on its part! 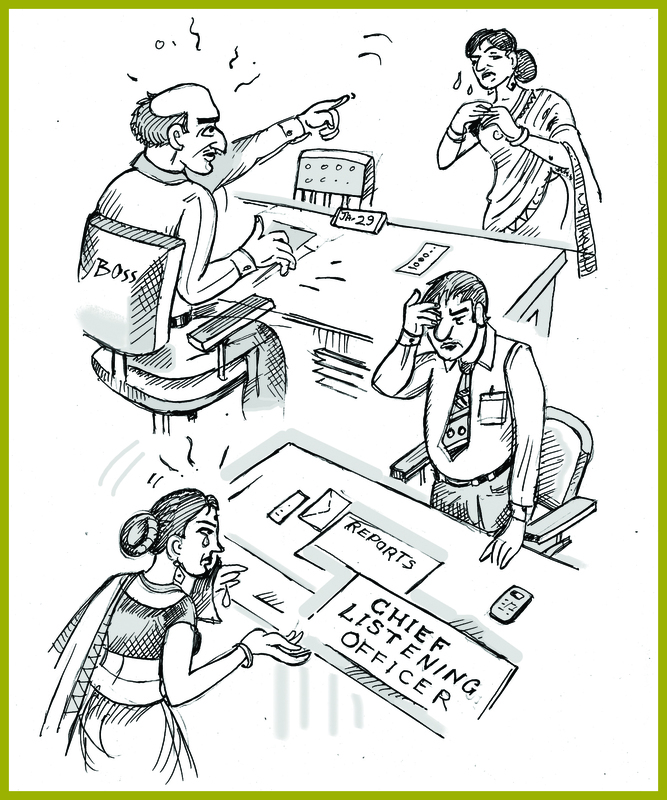 Chief Worrying Officer: Normally, the CFO who is worried sick about legal compliance in all areas of business. Chief Listening Officer: A VP-HR who is always ready with a bucket and towel to help employees facing emotional distress. Chief Results Officer: The CEO who believes that ends justify all means. Chief Dreams Officer: The R&D Head who keeps dreaming of new products and businesses. Chief Ethics Officer: Keeps a strict eye on fraudulent behavior anywhere in the organization. Quite a few bosses have an innate ability to be able to think in four dimensions at the same time – viz., the length and breadth of a problem, its depth and also how it may unfold over a period of time. If your boss is not a specimen from this tribe, and if he happens to jump to conclusions without evaluating all the other dimensions of an issue at hand, one can only wish you the very best in your career. If reporting to such a boss (God forbid! ), each day you will be having a roller coaster ride, much like NASDAQ/Sensex, linked to the vagaries and uncertainty of the mood of the “market” at any given point in time. In one such company where I had the good fortune to work (great learning opportunity, if I may say so), public shouting at subordinates was the order of the day. One day, a very sullen looking junior walked into my office. When I asked him the reason for his sadness, he said he was missing the daily “quota” of shouting from the boss that day!